In the Molecular Discovery Lab at BIOS, a deli-style fridge with sliding glass doors houses vials and bottles of chemicals used to track proteins, stain cells, and analyze DNA – as well as a small bunch of lettuce in the corner. It’s been picked fresh from the garden to satiate the appetites of the lab’s current visitors. “I suspect lettuce is a bit like chocolate for them,” said Postdoctoral Researcher Helena Reinardy. She has spent over two years working with the local species of variegated sea urchin, and keeps them healthy in the lab with a diet of seagrass and algae, supplemented with the lettuce that they love. Spiky sea urchins may come across as simplistic creatures, but Reinardy is quick to point out they have evolved elegant solutions to problems that continue to mystify modern medicine. The sea urchin’s skillset includes the ability to regenerate nerve, muscle, skin and spines; the perpetual vigor of youth, maintained over lifespans that can exceed a hundred years in some species; and on top of that, a virtual absence of cancer in wild populations. Cancer often emerges in an organism when the genetic instructions encoded in their DNA get scrambled or deleted. That damage can disrupt the genetic checks-and-balances that govern healthy cell division. In most organisms a certain amount of genetic degradation usually accumulates with age, because each time a cell divides to form a new cell, the genetic information must be copied and stray “typos” can occur. However, external conditions can also damage DNA. As a genotoxicologist, Reinardy is interested in understanding how toxic substances or changing environmental conditions impact genomes, and consequently animals. She became intrigued with sea urchins because of their ability to keep cancer at bay, reasoning they must either be very good at protecting their genome from damage, or very good at repairing any damage that does occur. 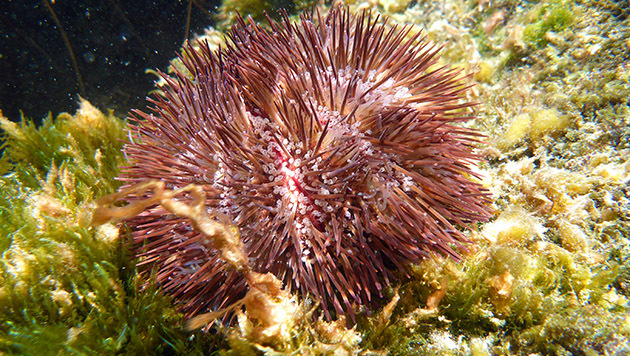 Reinardy has been testing how well sea urchins defend and repair their DNA following exposure to DNA-damaging agents, whether commonly encountered (like ultraviolet light) or catastrophic (like chemicals that induce breaks in the strands of DNA’s double helix). By exposing adult immune cells as well as larvae to the DNA-damaging treatments, she can compare how sea urchins may be more or less susceptible throughout their lives to stressors in the environment. Additionally, both immune cells and larvae are relevant to environmental monitoring. Immune cells in sea urchins have been analyzed to measure stress levels of organisms in polluted waters, and sea urchin larvae are commonly used in a test for environmental toxins. Since immune cells are easily extracted from sea urchins in the lab, and larvae can be acquired by inducing sea urchins to spawn in the lab, Reinardy also had the advantage of being able to run many tests with minimal harm to the sea urchins themselves. Her results, published this month in the scientific journal Mutagenesis, show that variegated sea urchin immune cells and larvae have different responses when exposed to the same concentrations of four DNA-damaging agents. Immune cells had lower rates of DNA damage than larvae did, and in most cases the immune cells successfully repaired damaged DNA within 24 hours. Taking advantage of the sea urchin’s well-studied genome, Reinardy was able to observe that both immune cells and larvae “turned on” a suite of DNA repair genes, indicating heavy investment in DNA repair. Why do sea urchin immune cells protect and repair their DNA so effectively? As the cells responsible for protecting the whole organism, they play a vital role in overall health. They also may fight cancer on a broader scale within the sea urchin. Reinardy believes the interplay between cancer and the immune system could be at the crux of the cancer resistance story, and deserves further study. In comparison, very few of the larvae survived the DNA-damaging treatments, but those that did survive were able to repair their damaged DNA within 24 hours. Reinardy speculates that sea urchins, which produce tremendous numbers of offspring, hedge their bets by maintaining a strong mix of genes ensuring that at least a few individuals will survive severe events in the environment. The variegated sea urchin is a relatively short-lived species with a lifespan in the wild of approximately three years. Another central question in Reinardy’s work is whether DNA repair is more efficient in long-lived species. Working with Ameena El-Bibany, a 2013 Research Experiences for Undergraduates intern from U.C. Davis, Reinardy and Bodnar tested the immune cells from three species of sea urchin and a more distantly-related sea cucumber. Their study was published last year in the journal PLoS One, where they reported that all species were susceptible to DNA damage but that over a 24-hour period each species was able to repair their DNA and survive doses that would be fatal to human cells. Intriguingly, the longer-lived species were found to more thoroughly repair damaged DNA compared to shorter-lived species, suggesting that long and healthy lives necessitate constant investment in DNA maintenance. 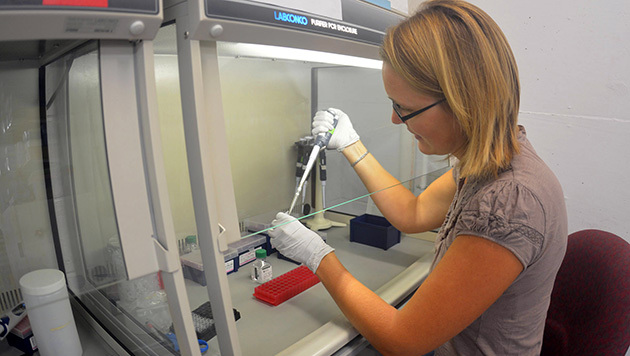 Before Reinardy joined the Molecular Discovery Lab, she had worked with fish to develop models clarifying the broad biological consequences of environmental contaminants. She had studied a range of organisms like salmon and trout that are directly and dramatically impacted in the environment, as well as so-called “model organisms” like zebrafish that have sequenced genomes to work with and are easily cultivated in the lab. With sea urchins, Reinardy found the rare opportunity to combine both worlds. “It’s a really cool organism to work with, because we get to study wild animals and yet there is the huge history of using sea urchins in developmental biology” said Reinardy. The extensive body of research on sea urchin cellular processes and the sequenced genome provide tools that biologists rarely get to use when studying wild animals in the sea. With her position at BIOS coming to an end, Reinardy is embarking on another study in contrasts. She is headed to the University Center in Svalbard, Norway, to study how byproducts from arctic mining and petroleum processes are impacting the biological processes of life in the arctic. It will be a new and much colder environment, but a familiar set of problems to solve.